Electronic Portfolios - What are they? depth of a person's work conveying the range of abilities, attitudes, experiences, and achievements. presentation files (edited from http://www.eduscapes.com/tap/topic82.htm). explanation of what portfolios are and why they might be used. Week of October 29, 2012: Wrapping up First Term - End of Term 1 is this Friday! This week is the last week of first term. It is your responsibility to complete all assignments you have left undone. You will have 3 days this week will full class periods and two days (Wednesday and Friday) with shortened class periods. Be sure you plan accordingly. 1. Check Power School to see what work you have remaining/undone. 2. Work diligently to complete as many of your incomplete tasks as you can prior to Friday. 3. If you are finished, absolutely finished, and happy with your current grade, you may begin working on researching information for your "Storms Project"
for Science. See me to get your group topic. work and submit what you are missing as soon as possible. 2. Review your personal website - do you have all items you were asked to upload there up-to-date? 3. Have you completed your Diigo bookmarking assignment? 1. Are you on track? How much do you have left to finish? Look at Power School and/or the grade sheet I gave you to review what you have remaining. 2. Finished? When is the last time you visited your website? Have you added anything to it? 1. Review the task list from last week and continue working on the 21 Things tasks you have not completed. choice of app(s) today so that we have time to get them loaded on the iPads we will be using. that today as well and submit it below. you have completed your video or skit, please bring it to me to approve and "save". share your folder with me. 1. App Review for our elementary visit tomorrow - we will do this together as a class. 2. Video creation for "iPad Use - How To" - we will discuss this in class. End of term is now one week away! Review your grades in PowerSchool and review assignments to determine that you have completed all required assignments for this term. catching up to do. If you are in that position, be sure to read through the previous weeks tasks and complete your missing tasks. paste this so you are sure to spell everything correctly. the "21 Things Folder" page. 1. Continue working on the 21 Things Cloud Management unit. See details above. website/ePortfolio, based on recommendations from this quest. "tracking document" for both Thing #2 (Cloud Management) and Thing #3 (Digital Footprint). 3. Complete and submit any items you have not yet taken care of previously. Review past assignments. 1. See task list from Monday. for submitting your 21 Things assignments. 3. Check PowerSchool to see what assignments you may still be missing. 21 Things "Quest 5 - AUP" assignment. "I'm ready to graduate" link back on your 21t4s Agent training page. 6. You should now be on the "Mission Completed" page. Follow all of the directions on this page. Be sure to submit your quiz results. 7. Review and revise your "21 Things Tracking Document". Re--submit this updated version to me on our 21 Things "Folder" page in the appropriate space. Don't forget about your science video lecture - if you don't have reliable internet access at home it would be a good idea to complete this in class today. will need to refresh your page after you submit each one. Things" section you have completed. 1. Discuss our trip to the elementary school for this Thursday. Bring in a children's book tomorrow to practice reading. 1. Practice reading children's books aloud to your group. 2. Go back to Tuesday, 9/25, and complete the Google Tips & Tricks assignment. Be sure to submit the clip in the space provided. 3. Go back to Friday, 9/21, and complete the video assignment. 3. Continue working on 21 Things Basic Orientation quests. 1. Complete any remaining tasks from last week (see below). 1. Finish up on any remaining tasks you have not yet completed from last week and/or this week. below. Follow the instructions and show me what you know. 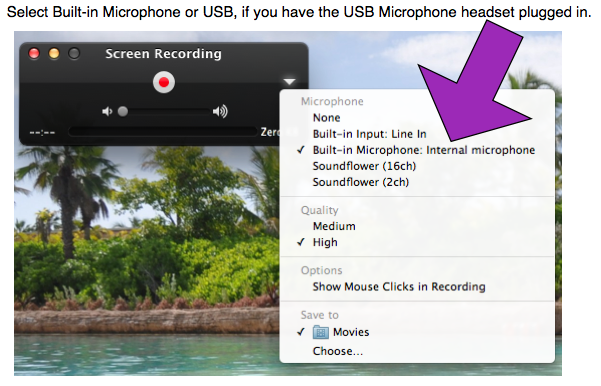 Please Note: When recording in QuickTime you will need to click on the small arrow (downward triangle) and select your sound input prior to recording. 4. Using the "Video" widget in Weebly, add this screen recording, named "Google Tips & Tricks" to the "Tech Tools" page of your website. or do homework from Science or another class. accomplishments you have made and will make. Students presents a game-based, project based approach to instruction for technology proficiency. 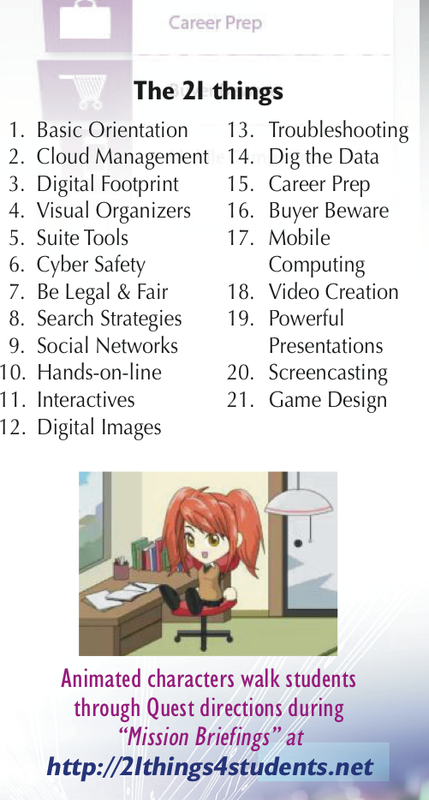 Take a look at the image to the right to see a listing of "the 21 things". your earbuds or head phones to listen to the audio files contained within the lessons. watching the video. Work through as much of the "Basic Orientation" as you can today. 4. Now, click on "The 21 things" image to the right and begin. 6. Name your folder "21 Things Your Name"
the 21 Things Quests and Missions. files and those of your classmates. NOTE: To listen to audio files, use Control+Click and select "Open Link in New Tab". You should now be able to press play in the new window and hear the audio. (steps 5-8) from yesterday's task list. permits, begin the "Undercover Ops Mission". In order to begin creating your student website, please visit http://students.weebly.com and log in. A. Drag a "Paragraph with Picture" widget to the top of the page (below the header image). i. Click on the image placeholder and add a picture of yourself (you can take this with "Photo Booth"). B. In the "Title Text" space, write "About Me". C. In the paragraph space, tell me your favorite color, your favorite song and your favorite movie - use complete sentences. your life (computers, iPads, cell phones, digital cameras, etc.). Tell me what tools you have used and what your comfort level is with them. What computer and/or tech skills do you think you have. How do you like to spend your time online? 4. Click the orange "Publish" button to publish your website. 1. Complete the task list from yesterday. 2. Open "Pages" from your dock and choose a poster template to open. careful not to use your last name. entire screen; Shift+Command+4 will allow you to select a portion of the screen). This will save on your desktop. 6. Click the orange "Publish" button to publish your website. 1. Complete task list from yesterday. 2. Open QuickTime (find this either in your Applications folder or by using the Spotlight Search). 4. Add a "Video" widget to your "Tech Tools" page (below the paragraph you wrote). Upload this video to your website.